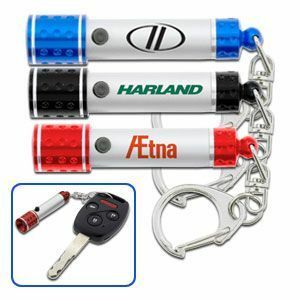 Inexpensive Custom Flashlight Keychains, Personalized in Bulk. Promotional, Budget Prices in the USA, Canada. Bulk aluminum flashlight keychains, custom imprinted with your logo or message. We also supply wholesale blank (not imprinted) aluminum flashlight key chains for $1.89 each. Budget Prices for USA, Canada for bulk flashlight keychains. American clients pay no taxes. Durable aluminum body with White LED and top quality key chain with clip. Free artwork design. We will send you a proof for your approval before going into production. Prices include a 1 color, 1 side imprint. Set up charge is $40.00. Additional colors/locations are $0.25/color/location, plus a $40 Setup Charge/ color/ location. Typical Production Time: 5 days after art approval. Blank flashlight keychains : $1.69 each (minimum 150), with next day shipping. Imprint Area: 1" x 1/4"
Typical Production Time: 5 days after art approval. Contact us for faster delivery.